ROELOFS, an exclusive partner of DataFromSky in the Netherlands, carried out comprehensive traffic research of a traffic node in the province of Gelderland. The data collected with a drone and analyzed by DataFromSky Aerial platform will be used as the main source for a study for planned major maintenance in 2021. 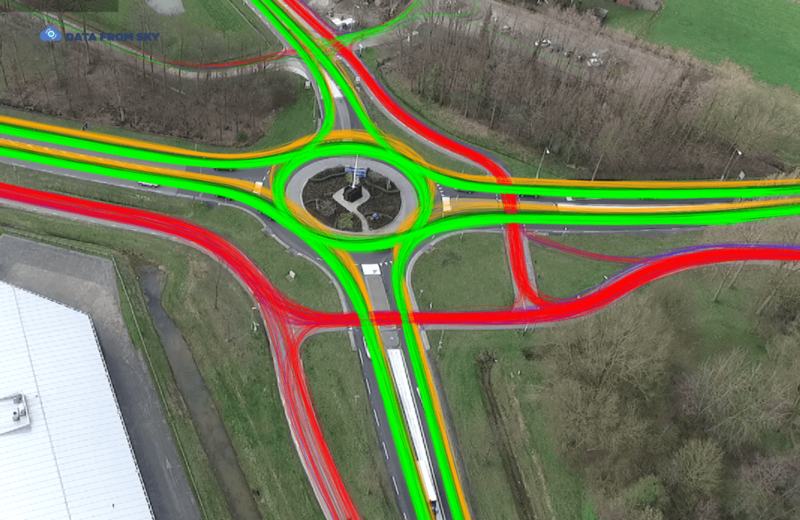 The drone was deployed at the roundabout of the N318 Misterweg in Winterswijk. When preparing for the major maintenance of this road, it is also being examined whether road safety can be improved. Besides other things, DataFromSky offers many great features for analysis of traffic behavior and road safety, including analysis of risky situations or near collisions, calculation of Time to Collision, Heavy Breaking and analysis of many other factors. For many years, the data were collected by people standing on the side and observing the traffic, then the data were evaluated manually. This process was lengthy, inefficient, and had low-precision data output. All of these shortcomings are overtaken with a new modern approach combining 2 great technologies of today world: drones and AI. Read a post in “de Gerlander” online magazine. Need to perform operational analysis of a roundabout based on the real traffic data? DataFromSky supports the calculation of a wide range of operational parameters such as critical-gap time / follow-up time / critical headway etc. Get super accurate traffic data for your research and/or traffic study regardless of the type of intersection using DataFromSky. Study of behavior adaptation effect. Automatic traffic analysis on an area of 55,000 square meters? Possible! Object counting and classification, gathering speed & acceleration data, O/D matrix and much more on an area of 55,000 square meters. DataFromSky is the name of the most advanced Aerial AI for an understanding of movements in videos taken by drones, balloons or helicopters. Take a look at another nice shot from Italy taken from a balloon. The length of the video is 2 hours and 31 minutes. DataFromSky tracked 5 455 objects (4881 cars, 325 medium vehicles, 77 heavy vehicles, 68 buses, 101 motorcycles, 1 bicycle, and 2 pedestrians) with the average speed of 12.24 km/h and the total distance traveled by all participants reaching 1 847 km! Do you need extremely accurate data about traffic flow? Contact us! detection of non-standard and aggressive behaviour, conflict situations, incomfort during passage etc. DataFromSky in cooperation with COWI is coming with a new traffic analysis from Denmark! As in all other major cities, massive amounts of traffic goes in and out of Copenhagen every day. This leads to congestion and the everlasting discussion on how to effectively move as many people as possible. In Copenhagen, almost 50 percent of all commuting trips are made using bicycles. This results in numerous potential conflicts between bicycles and cars, and the battle for allocating and distributing sheer road surface space between the transport modes is continually on – especially at certain locations, where available space is scarce. One such place is “Christmas Moellers Plads”, an intersection complex connecting inner Copenhagen to the island Amager. Through the use of a specialized UAV and Data From Sky, COWI has obtained a complete 4-hour overview of traffic passing through this complex for both cyclists and motorists – and the interaction between the two. The data extracted now forms the basis for looking into new and better solutions that will keep this people mover perform at its best. And we would also like to thank Dansk Drone Kompagni for providing us the video.